Inteliclinic | Not able to fall asleep at night for a long time? Here is something for you! Many of us complain about the constantly increasing level of stress in our everyday lives. Stress may result in difficulty falling asleep in the evening, and even have an impact on falling asleep in a couple years time. How many times did you wiggle in bed trying to finally doze off because you were thinking too much your work or personal life? On other nights, you might lay awake in bed simply thinking about insomnia itself! This vicious circle might seem eerie to some, but especially for elderly people it is a serious medical problem that needs to be addressed. The problem of various treatment techniques is that most of them are relatively new and precise doses or times of treatment are still being investigated. One such method is light therapy, as people who use it are not sure how long light exposure should be. According to a study described in “Twenty minutes versus forty-five minutes morning bright light treatment on sleep onset insomnia in elderly subjects” by C. Kirisoglu and C. Guilleminault from the Stanford University Sleep Disorder Clinic, most people use light therapy for about 20 minutes, as they find this period of time easiest to accommodate in their everyday lives. Unfortunately, it turns out that patients suffering from sleep onset insomnia (inability to fall asleep) or psychophysiological insomnia (inability to fall asleep because of too much worrying about insomnia) who were exposed to 20 minutes of bright light get worse results in their insomnia treatment tests than those exposed to bright light for 45 minutes. Furthermore, not only did they (the group with a 45 minutes exposure) have better results right after the trial, but they also showed the maintenance of the beneficial effects on their sleep quality over the course of 3 and 6 months, while the 20 minute group had worse results right after the end of the test, after 3 months, and showed no positive change in sleep after 6 months in comparison with the time prior to the trial. This study shows the importance of appropriate exposure times during light therapy. Of course, there are still many other ways to improve our sleep even if we lack access to light therapy. 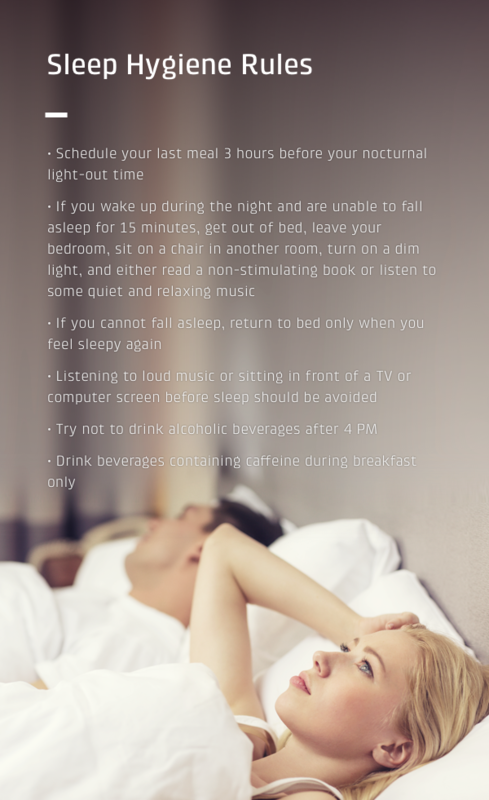 We have compiled the following list of rules you should follow if you want to start sleeping better today.